Tyler Dikman wears a Rolex watch. He racks up nearly 6,000 cell phone minutes a month doing business. He never leaves home without his exclusive American Express card reserved for cardholders with at least $150,000 in charges a year. And he has discussed the future of wireless networking with Bill Gates. Tyler is 18 years old. Stories of teenage tycoons were a recurring theme during the height of the ’90s dot-com boom, but many young millionaires came and went. Take Shawn Fanning, founder of Napster, who didn’t make quite as much as he expected when legal problems forced him to close his file-swapping service and sell off its assets. But today, the young and wealthy show that the era of the teenage millionaire is still alive and well. Entrepreneurs like Tyler have come a long way from the days of mowing lawns and delivering newspapers in order to make some extra pocket money. Tyler was just 15 when he started CoolTronics.com, a computer supply company. With annual sales of $1.5 million, the Florida-based techno whiz has now opened an office in Silicon Valley in his freshman dorm room at Santa Clara University in California. Tyler was on the road to financial security when most kids were still getting allowances. At age five, Tyler was making $22/hour selling lemonade. By ten, he was charging $37 for 30-minute birthday party magic shows and using the money to buy stocks in Coca-Cola and McDonald’s. Chris Mole, 18, from the United Kingdom spotted a gap in the market for a company to sell cheap computers to students. He launched Studentdesktops.com in September 2002. At that time he was making nearly three quarters of a million dollars with reports of a $9 million turnover by June 2003. It was just as well that Chris came up with his idea and parlayed it into a success—his school exam results were mostly D’s and F’s. Also turning a major profit is 14-year-old Elise MacMillan. Together with her grandmother, the Colorado teen has been making candy since the age of three. Elise began official production about four years ago. 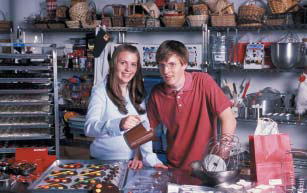 Now Elise and her brother Evan, 17, produce their chocolates in a commercial kitchen where they also have their offices. Their company, The Chocolate Farm, was named Ernst & Young Entrepreneur of the Year in 1991 and rated one of the top youth food businesses in the U.S. in 2001. Mary-Kate and Ashley Olsen may be the richest child stars ever. The Hollywood Reporter named the Olsen twins, at the time just 16, two of the 100 most powerful women in Hollywood. They have a vast teenage empire with a slew of entertainment, fashion and lifestyle products that are part of the Mary-Kate and Ashley Olsen line. These include books, videos, CDs, sportswear, cosmetics, shoes and chairs. People Magazine reports that Mary-Kate and Ashley’s personal worth is $114 million, while their company, Dualstar, made an estimated $1.5 billion in 2002. Joining the teen millionaire celebrity pool is rookie basketball sensation Lebron James. The 18-year-old only just graduated high school and has already signed a $20 million NBA contract with the Cleveland Cavaliers. He has also signed endorsements worth reportedly $150 million with Nike and Coke. While having millions may seem like the ultimate fantasy, for Athina Roussel, the world’s richest teenager, extraordinary wealth may turn out to be a burden. The 18-year-old granddaughter of shipping tycoon Aristotle Onassis recently inherited half of the family fortune, which CNN estimates is worth $4 billion. 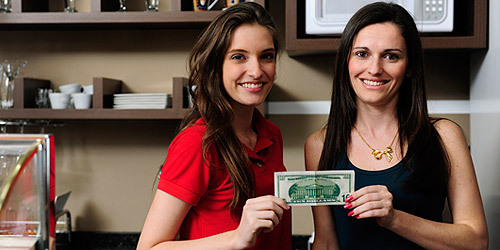 Athina has been both envied and pitied over the years leading up to her inheritance. On the one hand, she had a charmed childhood complete with a zoo, animal trainer and dolls dressed in miniature Christian Dior clothes. On the other hand, she spends her life today under 24-hour security to guard against kidnappers, and is never without eight bodyguards. She has also been the centre of a bitter legal argument between her father, Thierry Roussel, and the Greek trustees in charge of her inheritance. Money can be both a blessing and a curse. Whether you inherit it, cook for it, sing for it or just plain work hard for it, once you’ve got your money, what you do with it will define who you are. I would probably save it until I went to university and studied to become a chef. Then I would open my own restaurant, and once it is up and running I would travel the world and visit places that I’m interested in. I would spend half of it on cars. I would probably buy seven nice cars, one for each day of the week. I would put some into stocks and put the rest that I have left over into the bank. I would build my parents and myself our dream house, give some to charity, give some to my grandparents, and probably travel the world. I would pay for my family’s university fees and I would go to university as well and get a great, high paying job that will give me more millions. I would give half of it to children in different countries who are starving. Even though half a million dollars wouldn’t feed all the hungry children, I believe it’s a start, and hopefully it would inspire other people to donate money. I don’t really know what I would do with the rest, so I would probably save it. I would pay off any debts that I had. I would travel the world to places that interest me, and I would also start my own radio station and only play songs that I like. I would buy a villa in Tuscany. I would pay for my university, give some to charity and invest some.